This race was much better than I had anticipated! It was held in Hampton, VA only about 30 minutes away. But, because of possible traffic, we decided to stay overnight at the host hotel. It was great to get up and be able to have breakfast and then walk over to the start line. The race started at 8 am, so we left the hotel about 7:30 and walked right into the start corrals. 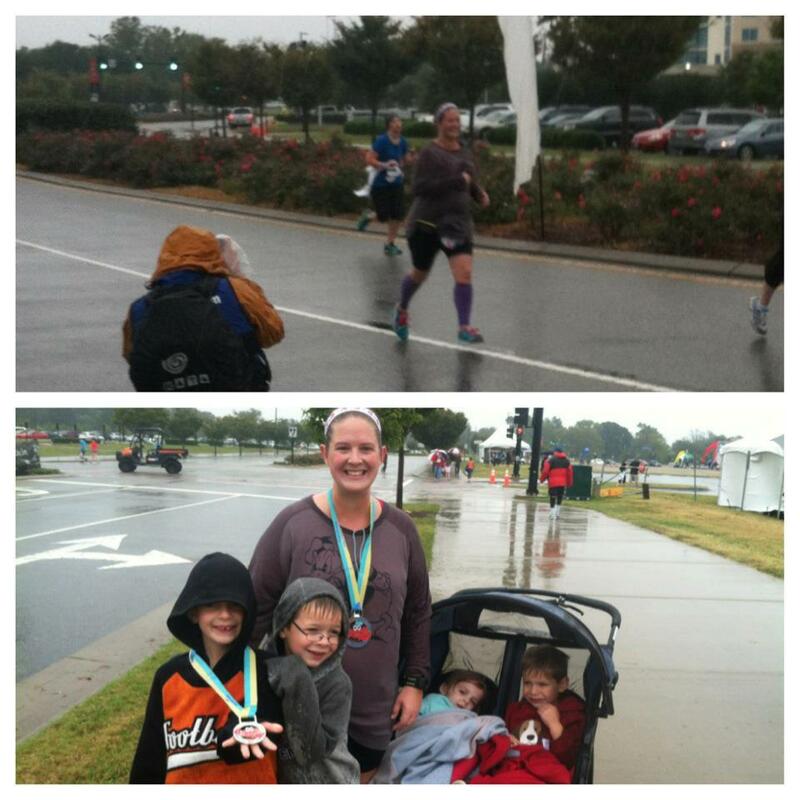 I was doing the half marathon with my friend Jody and my mom and Caleb (oldest kiddo) were doing the 5k. It was a little cooler than I had planned for, and luckily I had picked up a long sleeve shirt at Target yesterday that I wore over my tank top. Once we got started, I warmed up pretty quickly. I was following a run/walk plan for this half with my ratio being 3 min run/1 min walk. That was working really well for me. My 10k split was 1:26:58, which would be the fastest 10k I have done to date (that's my time to beat for the Wicked 10k coming up at the end of the month). I was moving along really well. The course was nice, they really took us through some nice areas. Then came mile 10. And the rain....cold rain. And the wind. Last year the only race I got rained on was also in October....if it rains on me for the Wicked 10k again this year, I may boycott October races :) Just not my favorite conditions to run in. But, coming up at the end I had 7 really great people waiting on me :) That in itself was worth the rain and cold! This makes half marathon #8 of the year. And it will definitely be my last half marathon of this deployment! Congrats! 8 in one year, that's awesome!